The Pennsylvania Horse Breeders Association (PHBA) is responsible for all aspects of the Pennsylvania Breeding Fund, the official registration, marketing, and promotion of Pennsylvania-Bred thoroughbred race horses, as well as the maintenance of the official registry of PA-Bred race horses and Pennsylvania stallions. We are mandated by state statute as administrator of the Pennsylvania Breeding Fund program and as official registrar of the Pennsylvania-Bred roster of eligible program participants. The mission of the organization is to advocate on behalf of Pennsylvania’s Thoroughbred breeding industry. PHBA is devoted to those involved in the industry, and whether you are currently a breeder, or you are just considering getting involved in this exciting industry, there are many reasons to join our organization. As a not-for-profit organization, founded in 1948, PHBA provides a number of services to its members, including informational assistance, educational opportunities, and a variety of members-only social events. Additionally, PA-Breds have preferred starter status in all overnight races at PARX, Penn National, and Presque Isle Downs, with the exception of certain races whose specific conditions outline additional preferences, such as certain turf races or starter handicaps. 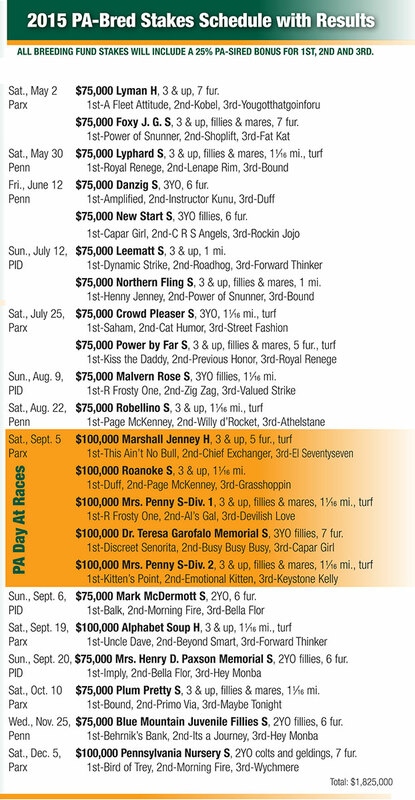 In these races, PA-Bred preference is general to the sub-groups of entrants. Working with industry leaders over the years, PHBA has achieved several goals that have brought reforms and benefits to breeders, owners, racetracks, and the general public. We will continue to provide representation and advocacy in the state Capitol and at industry gatherings. PHBA is a vital organization for those involved in breeding throughout Pennsylvania — your support and participation can help us reach our full potential. Please visit Frequently Asked Questions and Why PA-Breds? to learn more about the Pennsylvania Breeding Fund program, or call the PHBA office with any questions.